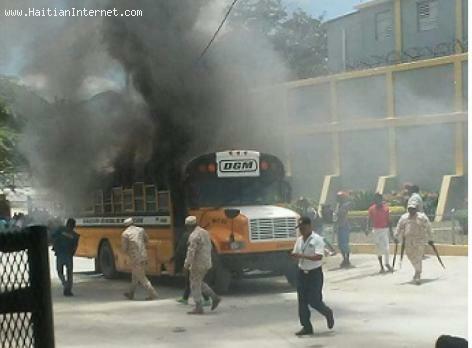 A Dominican Republic immigration bus carrying Haitian illegal immigrants to Haiti caught fire along the way not far from Elias Pina, D dominican border town with Haiti. According to news reports the Dominican immigration bus was completely consumed. Luckily no one was injured. The Dominican government is investigating to find out how this incident happened. There is an assumption that one of the illegals on board may have caused it.